Ani Rinchen Khandro is a life ordained nun in the Kagyu tradition of Tibetan Buddhism. She spent the first ten years of her ordained life at Kagyu Samye Ling Monastery where she studied and practiced Buddhism under some of the most eminent Tibetan Lamas of today. During this time she was also responsible for the publicity, public relations and fundraising for the Monastery and for the Holy Island Project for World Peace and Health. In 2003 Ani Rinchen Khandro entered the traditional, long-term, closed retreat of three years, three months, three weeks in the women’s retreat on Holy Island. Having successfully completed this intensive practice she resumed work and teaching at Samye Ling and was commissioned to write a book celebrating the Centre’s 40 th Anniversary, Kagyu Samye Ling – The Story charting the remarkable journey of Tibetan Buddhism to the West. 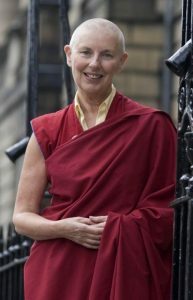 In 2008 Ani Rinchen Khandro was appointed by Samye Ling’s founder Dr. Akong Tulku Rinpoche and Abbot Lama Yeshe Losal Rinpoche to establish and run Kagyu Samye Dzong Edinburgh, a Tibetan Buddhist Centre for World Peace and Health. After receiving the blessing of His Holiness Karmapa, the head of the Kagyu Lineage, Ani Rinchen Khandro found the ideal property which, with the help of many volunteers, became a beautiful Centre in an iconic building at 25 Bernard Street, by The Shore in Leith. As well as a weekly programme of meditation sessions, pujas and classes the Centre also hosts a variety of monthly events, including teachings and public talks by visiting High Lamas, therapeutic and interfaith activities. The Centre has an open door policy and serves, not only the Buddhist community, but the people of Edinburgh as a whole. Ani Rinchen Khandro is also the Honorary Buddhist Chaplain for the University of Edinburgh and a Buddhist representative for the Edinburgh Inter-Faith Association. Her extra mural activities include speaking at the Scottish Parliament and at Edinburgh University as well as sundry Schools and as a lively contributor on Buddhism for TV, Radio and at Conferences.